I will be the first to admit that my house has very little curb appeal. Built in the late 1970’s, it’s a typical one story, Midwestern brick ranch with no architectural details and very little character. In fact, the exterior shutters are the only decoration on the front of the house. While the shutters add a little bit of interest, they fall seriously short of adding actual curb appeal. For starters, the shutters are not functional – they are just decorative panels attached to the brick. Secondly, they were incorrectly sized. The windows are rather large (42″ wide), and the builder installed a stock 12″ louvered shutter. These two factors make the shutters look puny. Like they were an afterthought. Finally, they are not in great condition. The paint is peeling, they are dented (too many whiffle ball games in the front yard! ), and some have been installed upside down. When chosen correctly, exterior shutters can add a tremendous amount of curb appeal to a home. But, how do you choose? The two biggest decisions are style and size. Start with the shutter style. Exterior shutters come in a few standard styles: louvered, solid, paneled, board and batten, Bahama, cut-out, and a combination louvered and paneled. Be sure to pick a style that accentuates the style and location of your home. For example, a Bahama shutter will look very silly on any house that’s not tropically inspired or in a tropical location. Most houses will look best with a paneled or louvered shutter. As for color, again, pick something that is going to accentuate the style of your home. If your home has warm, earth tone colors, then pick a shutter that is warmer rather than a bright color. Personally, I like a lot of contrast, like white shutters on red brick, black shutters on a light colored stone wall, or bright blue on a light stucco wall. Selecting the correct shutter size is, by far, the most important decision when buying new shutters. The style and color don’t matter if you pick the wrong size. I’ve seen shutters that are too long, too short, or too narrow. Don’t buy an incorrect sized shutter just because it’s cheaper. Rather than adding curb appeal, incorrectly sized shutters just look silly. 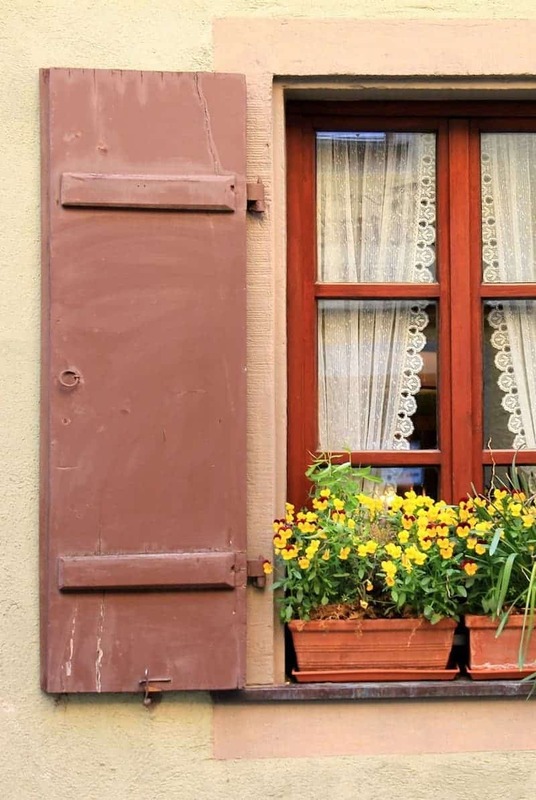 Take a scroll through this Houzz Ideabook of exterior shutters and find some curb appeal inspiration. Did you find any inspiration in this idea book? After putting it together, I’m pretty sure I’m adding new exterior shutters to my spring to-do list. Looking for more curb appeal ideas? Check out 15 Garden Gates to Add Curb Appeal to Your Home. « What is Art Deco Architecture?